EaseUS is a famous name within software companies. Their products are very popular on Cnet download and they requested us to do a review about EaseUS Todo Backup. We personally think backup software are very important and can´t wait to see what this software can offer users. We have reviewed the free version of EaseUS Todo Backup. There are multiple versions each with more features. But we will get into that later. 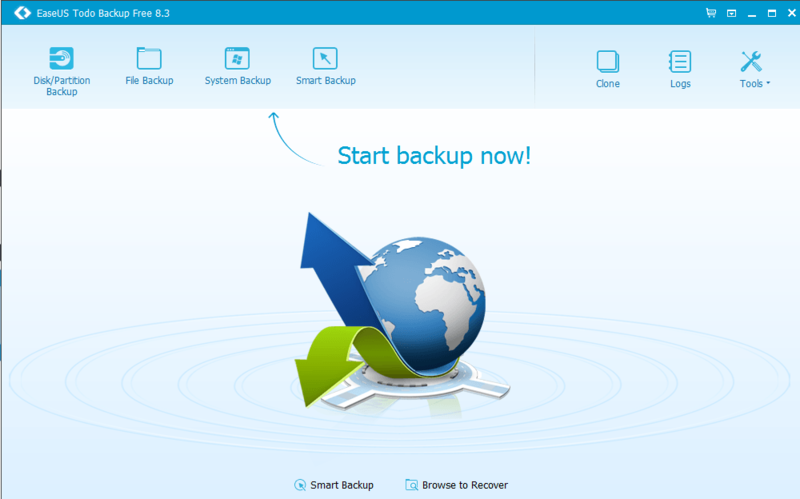 The free version of EaseUS Todo Backup offers a good amount of features for the user. It has the ability to do a Full, Incremental, Differential or a Scheduled backup making it very easy for you to decide when to do the backup, which kind of backup you want and if it should be made from scratch or new files be added to a previous backup. Next to that EaseUS Todo Backup offers you the ability to do a full System and Partition backup which is a good thing as this will give you the possibility of restoring your entire operating system when it stopped working in my eyes an absolute must have a Backup software. It also has some more advanced features that normal computer users will in the end never or rarely use such as Clone HDD and Migrate OS to a SSD / HDD. This gives you the possibility (Clone HDD) to literally copy the entire contents of Hard Disk A to Hard Disk B after the backup the drives will match each other. Migrate OS to a SSD / HDD offers you the possibility of transferring your Windows installation to a new hard disk. The program offers some good features for a free version. I think they should have left out Migrate OS to SSD / HDD and give us Outlook backup in the free version. Outlook backup is something that will be used much more. But still the program scores a 8.5 on features which is a good score. The program itself looks very good it has a clean and clear user interface without too many buttons, text and other messy things. The choice of colors and font style is very good and make the program easy to read. The navigation of the program is like the design very clean and clear it shows only the the things the user want to see and nothing more. There is nothing more to say about the design, it clean, clear and quite beautiful. The program scores a 9.5 on Design. The styling of the program has the same UX idea as Windows has making the program easy to use for people who are used with working with Windows. The hard disk are shown the same way as Windows does in My Computer. Directories are shown the same way as “Save as…” does. Take a look below, those images tell more than I could. The program shows clear instructions on what it’s about to do and what the result will be of the action the user invoked. EaseUS Todo is a user friendly and easy program to work with scoring a 9 on Ease of Use. EaseUS Todo Backup offers all the features the average Windows user will ever need from a backup solution and with the price tag of 0 dollar it’s an excellent program to run your backups with. The user friendly design and clean design make the program suitable for any kind of user no matter what their technical abilities are. However we did miss the Outlook backup feature in the free version. With a score of a 9 out of 10 EaseUS Todo is one of the best free backup solutions out their.